Through a combination of nonprofit partnerships, volunteer activities, grants and other local investments, Wells Fargo is strengthening our community. The company focuses its philanthropic efforts on innovative, long-term solutions to meet local needs. Over the years, the Wells Fargo Foundation has stepped up to help fund various United Way of Central Carolinas initiatives. Following the civic unrest in Charlotte in late 2016, Wells Fargo was the first and largest funder to back United Way’s Unite Charlotte, an initiative that works with small, grassroots organizations to improve racial equity and increase social capital. “True social change takes time, but programs like Unite Charlotte can be a great catalyst for addressing underlying and systemic issues like racism, access, equity and inclusion,” said Jay Everette, Wells Fargo’s senior community relations manager. Every fall, Wells Fargo holds a campaign for employee giving that includes kickoff activities and community projects. The company continues to be one of the largest local funders of United Way, mirroring their No. 1 giving status with United Way globally, and partners with United Way on a Community Education Fund. The company’s local support extends beyond its financial commitment – Wells Fargo team members consistently help make an impact in our community through their passion, time and expertise. 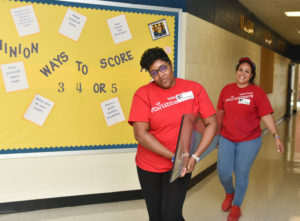 This school year, Wells Fargo is adopting a kindergarten classroom at the Dilworth Elementary Sedgefield Campus through Tutor Charlotte, a joint initiative of United Way, Read Charlotte and Charlotte-Mecklenburg Schools to provide high-quality reading and math tutoring for children. At the school, employees volunteer to read one-on-one with students for at least 30 minutes every week. 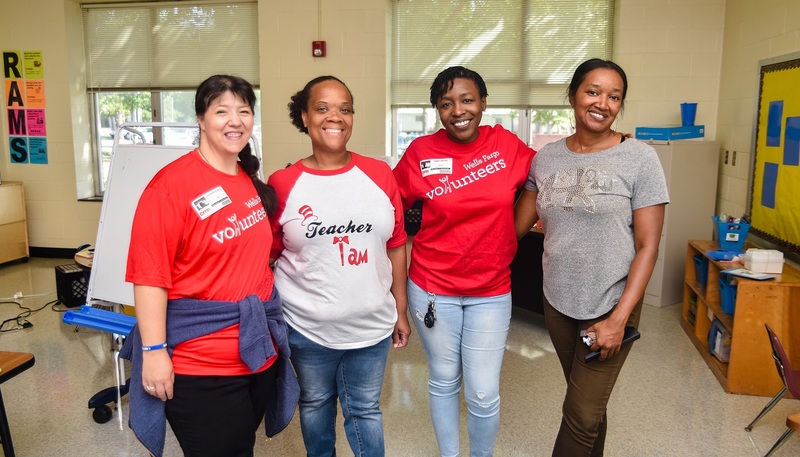 Wells Fargo employees volunteer thousands of hours annually in the greater Charlotte region, including participation in community projects organized by United Way’s Hands On Charlotte. 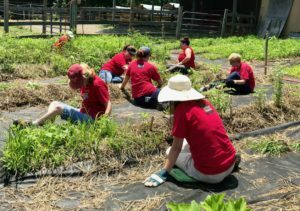 During the summer, Wells Fargo held its Days of Caring that included tasks like beautification work at Wings of Eagles Ranch and crafting baby blankets and onesies for Baby Bundles. And in August, employees provided on-site support for Promising Pages and Crisis Assistance Ministry and got involved with projects at area schools during the inaugural Live United Day: All In For The Kids initiative led by Hands On Charlotte, the Charlotte Chamber and Charlotte-Mecklenburg Schools. Hands On Charlotte helped organize additional service projects for Wells Fargo in September to coincide with the kickoff of the company’s annual United Way employee giving campaign. 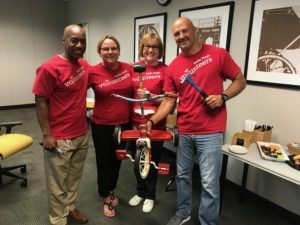 Projects included assembling 75 bookworm buddies and 125 snack packs for the Boys & Girls Club of Greater Charlotte and Classroom Central, as well as building tricycles for Refugee Support Services, a United Way partner and Unite Charlotte grantee. We thank Wells Fargo for its commitment to creating a stronger Charlotte and a global community of care through community giving, employee engagement and philanthropy. United Way’s Hands On Charlotte makes it easy for companies to engage their employees. Click here to find out more.